There is always a hint of the unexpected in an Edgar Wright project. The man has a talent for making even the most mundane happenings seem dramatic, and a tendency to find the most oddball tales and present them on screen in a manner that has the audience gaping away, open-mouthed and wide-eyed. Post the Ant-Man debacle, and coming off 2 underwhelming projects, Wright went back to the drawing board and decided to present a passion project, a story he’d nursed for almost 20 years, a genre blending tale of a heist, and one of the key players in it. So the question is, can Baby Driver manage to strike that right balance between visual flair and an outlandish tale? 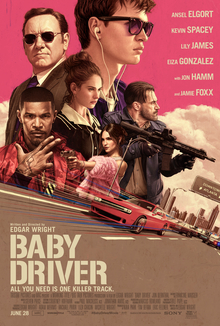 Baby (Ansel Elgort) is a getaway driver working for a robbery kingpin Doc (Kevin Spacey) to clear a long-standing debt, and owing to a childhood accident, suffers from tinnitus, which he deals with, by listening to music on an old iPod almost all the time. When he meets a sweet-natured waitress, Debora (Lily James), Baby begins to grapple with his conscience and the fact that there may be more to life than speeding away from the law, and contemplates a future involving the highway, and an unending flow of music. But when he’s called for a final job with a team involving Buddy (Jon Hamm), Darling (Eiza Gonzalez) and Bats (Jamie Foxx), does Baby go with his gut, or does he stick to what he does best? Edgar Wright is in top form here, as he combines the frenetic pace of Hot Fuzz and the visual quirk of Scott Pilgrim to narrate a tale that will have the audience at the edge of their seats right from the opening credits involving a heist timed to such absolute perfection, right up till the frenzied climax, that starts off with a smooth Barry White interlude and ends with the hysterical vocals of Freddie Mercury. The soundtrack involving some of the grooviest numbers from days of yore, and the highly inventive cinematography by Bill Pope just add to what’s an absolutely exhilarating experience. Baby might just end up being Ansel Elgort’s star making role, where he plays his part with charm, vulnerability and just a little goofiness. Lily James is absolutely adorable as the gentle Debora, and shares a warm chemistry with Elgort. Kevin Spacey as the grumpy mastermind, Jon Hamm as the charming junkie, Jamie Foxx as the deranged muscle, Eiza Gonzalez as the sultry femme fatale and CJ Jones as the protective guardian are all absolutely perfect in their parts, and prop up a solid ensemble. To sum it up, Baby Driver is an absolute treat for the senses, a smartly written heist thriller, combined with some edge of the seat action, niftily shot car chases, and a soundtrack so joyous, it sounds like a celebration of life. Do not miss out on this one, as it is a cinematic experience so giddying, it’s worth surrendering yourself to.